A Trip to Coburg, Germany Is Worth Your Time. So, here’s a fun little backstory. 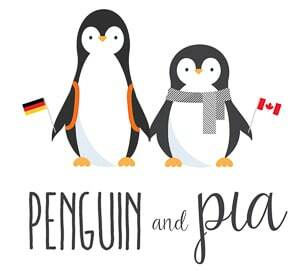 There’s a small city in Bavaria called Coburg and Penguin and Pia has a deep connection to the city. Why? Because it’s where Lisa grew up! Who would have thought – a small town German and a small town Canadian finding one another. Thanks, Edinburgh! That said, Coburg, is a beautiful place to visit and so we’re looking forward to sharing all the details about this picturesque place. 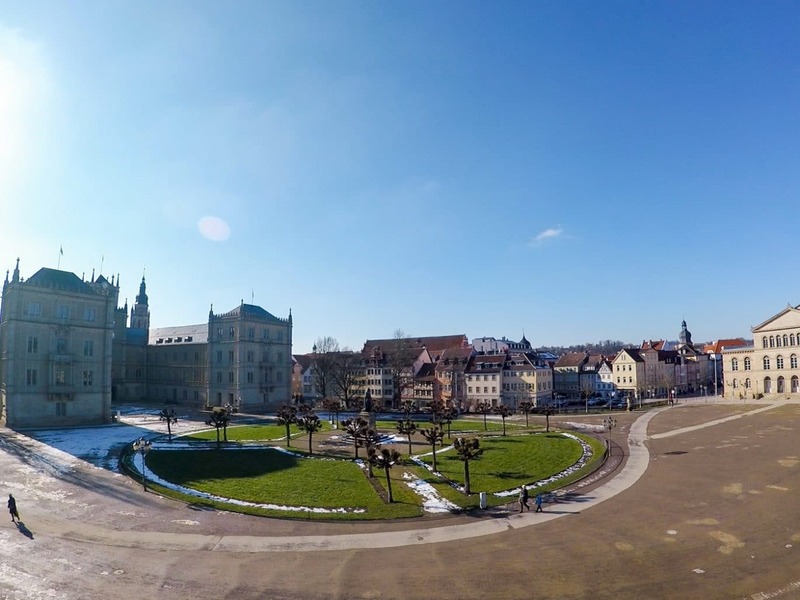 If you are travelling to Germany for the first time, Coburg is a small but great destination. In fact, it even made the grand list of beautiful places in Germany as told by German travel bloggers! In Coburg, Germany, royal history plays a huge part in the city’s backstory. Coburg is the birthplace of Prince Albert who was married to Queen Victoria. The Coburg Castle (called Veste Coburg) is one of the largest in Germany. 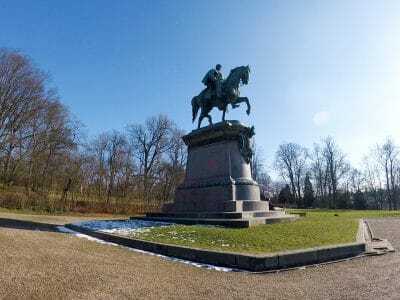 Overall, there is plenty to see and discover in Coburg for any traveller heading through the south of Germany. Think of this as your very own local guide to the hidden gem of Coburg. 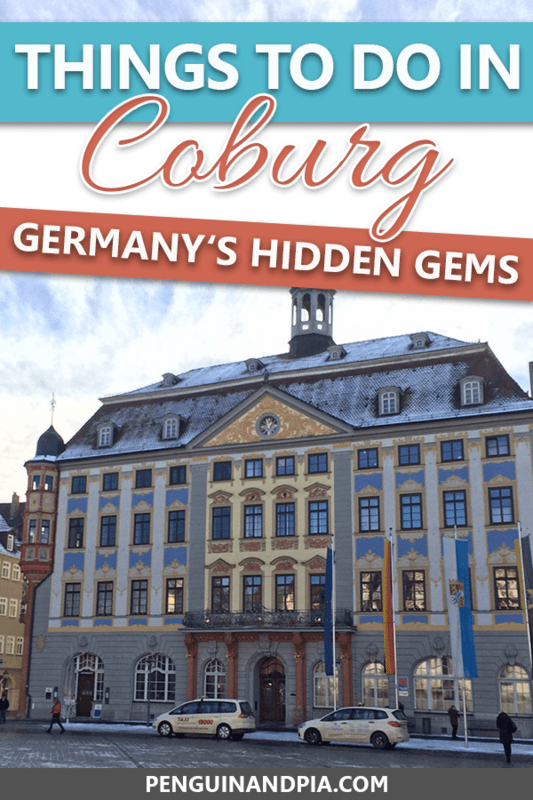 Let’s dive into why Coburg should be your next “must-see” destination! If you want to get a sneak peek of what Coburg looks like, watch the video snippet below. In case you want to see the whole video, you can find it on our YouTube Channel here. Looking for Thermal Springs? Check Out Wiesbaden or Beautiful Mainz Close by! You need to see Aschaffenburg’s Classic Old Town! The Small City of Aachen Should be on Your List! This is probably a good place to start. Coburg is a small city in the most northern part of Bavaria called Upper Franconia. It’s located about 2.5 hours north of Munich and 2.5 hours east of Frankfurt. You’ll be in the heart of Germany, so it might be a good idea to brush up on those German phrases! Coburg is actually not that difficult to reach given that it’s connected to a few of the major centres in Germany. If you’re travelling from the South (Munich) it should be easy with a direct connection or you’ll find a train with a maximum of one connection, and that connection is almost certain to be Nuremberg. If you’re travelling from the north you’ll likely go through Frankfurt, Würzburg, Bamberg and then head to Coburg. Stopping in any of these cities along the way is also recommended since they are worth checking out as well! Overall, getting around by train is very easy in Germany. You can find a train connection and book your ticket here at the Deutsche Bahn Website. Our recommendation is to book tickets in advance otherwise the fares can be a lot more expensive. 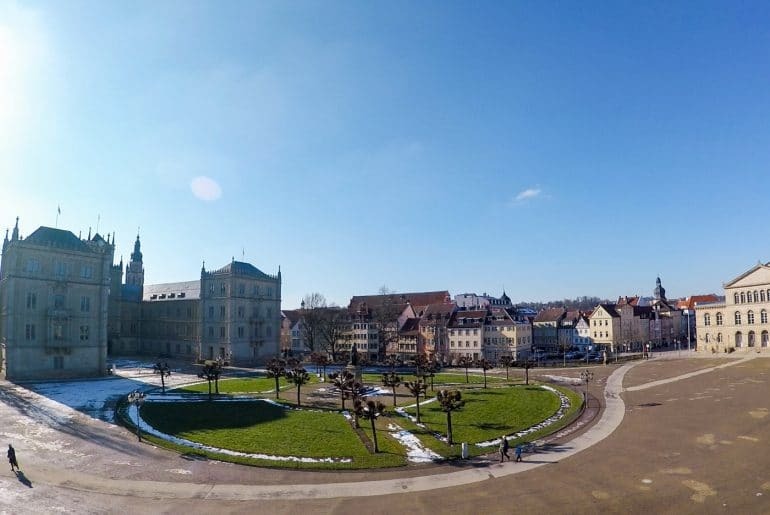 If you decide to travel to Coburg from another city in Bavaria (e.g. Munich or Nuremberg) and only travel with regional trains (not intercity trains) you should get the Bayern Ticket which allows for free travel on regional trains in all of Bavaria for one day. This option is often cheaper than a regular ticket – especially if you are a group of people. Another option is to take a Flixbus. There are direct connections from Munich as well as buses with one transfer from Frankfurt and a few other places. Most of the time the bus is slightly cheaper than the train, but the journey can take longer. You can check the schedule and book a ticket at the Flixbus Website. Coburg was actually part of the German state of Thuringia until 1920 and only joined Bavaria after a vote. Until the revolution in 1918, it was the part of the Duchy of Saxe-Coburg-Gotha. The readers who are history/royalty buffs might have heard of it before since the ruling family married into many important royal families in Europe. Most notably, Coburg is the birthplace of Prince Albert who married Queen Victoria of England. It has also ties to the Belgian royal family. Also noteworthy is that Martin Luther, an important figure in the Protestant Reformation, lived in Coburg for a few months in the 16th century to translate parts of the Bible into German. He actually lived in the Veste Coburg (the castle on top of the hill) which is still standing today and attracts visitors every year! If you wanted to spend a whole day in Coburg, you might decide to stay in the city for one night. Not a bad plan! Since it is a small city there are not that many places to choose from. Nonetheless, there are some really good options. The Romantik is one of the best and most favoured hotels in Coburg. Every local has heard of it – and not just because it looks stunning from the inside and out! According to Booking.com it is the place that’s the best value for your money in Coburg. This is because of a few key factors. The Romantik has a great location allowing you to walk into the centre within minutes. There are lots of restaurants close by but they also have a restaurant and stunning bar on-site. Breakfast is even included. If you want a romantic and relaxing experience, check the Romantik for availability now! 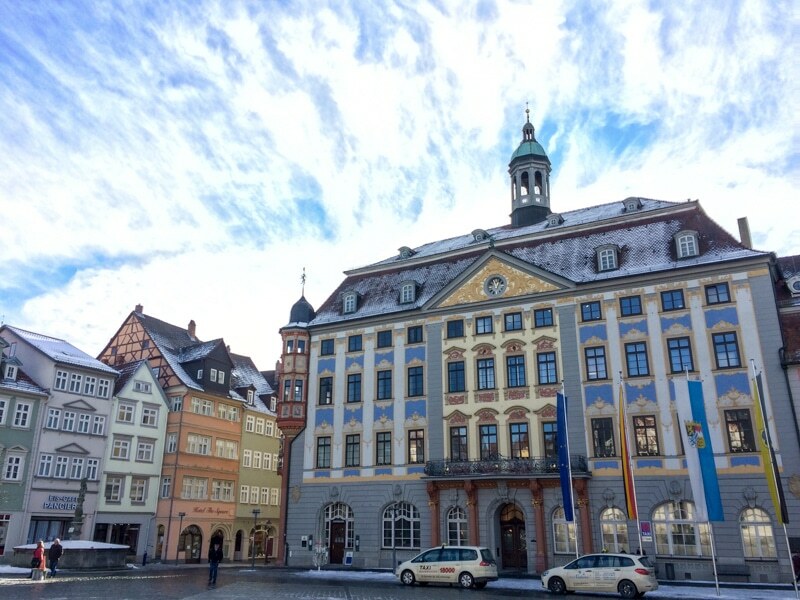 Located in the middle of the center of Coburg, The Square is steps away from the historic market square. If you’re lucky, you can even see the Square from your hotel room! The Square is the cheaper option compared to the Romantik, but it’s still a great place to stay. Guests can choose between rooms and apartments – some of which even come with their own kitchenette. All the best sights and cafes can be reached within minutes, so this is a great option if you want to be close to the center but not spend a ton of money. Check your dates at The Square now. From historic buildings to giant castles, there’s lots to do and see in Coburg for any interests that you might have. We list a few of the best things below. Known for the famous Coburg Christmas market that that takes place each Christmas season, the Square was first established in the early 15th century. The building in the photograph is the town hall – a beautiful piece of architecture – that was built around the same time period. In the middle of the market square you’ll find a monument of Prince Albert, which was a present from Queen Victoria to the birthplace of her deceased husband. If you’re looking for a snack, there is also a stand where you can try the well-known Coburger Bratwurst sausage! If you just wander through the Old Town you’ll see lots of historic buildings as well as many statues and monuments. Along the way, you’ll also see other attractions mentioned in this section such as the Morizkirche and Ehrenburg Castle since the town is quite small and everything is easily reached by foot. The roads are mainly cobblestone so be sure to wear comfortable shoes! The Morizkirche is the oldest church in Coburg, dating back to a Roman basilica from the 13th century. The original foundations can be seen to this day. Over the centuries, the church has been renovated a few times. For all the bell enthusiasts, there are five bells in the tower – the biggest of which weighs 2.5 tons! For the history buffs, from 1958 for almost 30 years this bell rang every evening at 9 pm for 5 minutes so that the people living in both East and West Germany could think of each other in prayer. If you are interested you can go inside the church to have a look for yourself. Here’s the website to have a look at the opening hours. The Castle is one of the main attractions in Coburg, and it can be seen from many places in the city. Some parts of the castle date back as far as to the beginning of the 13th century! Veste Coburg had an increase in its cultural importance at the beginning of the 16th century when the Elector of Saxony used to spend more time there. Over time, they started an art collection – and you can still visit the art collection today. Overall, the Coburg Castle is one of the biggest German castle complexes by size. We recommend hiking up there because you’ll have incredible views of the surrounding area! Here is the website for Veste Coburg. The gardens surrounding the Veste Coburg are called Hofgarten (court garden) and you’ll walk through it when you go up to the Veste. There are different routes up to the Veste (some including stairs) but as long as you go up in elevation you can’t go wrong. Don’t worry, there are also lots of signs! In the gardens, you’ll see different monuments and water fountains. Many of these things have explanations that are even in English if you’d like to learn more. In the spring/summer, locals often head to the gardens to enjoy the sun, so grab some picnic items and a blanket and find a spot in the park! You can’t miss the Palace. Located in the big square before you head up to the Hofgarten and the Veste you’ll find this building. It’s called Ehrenburg Castle and was the residence of the dukes of Saxony-Coburg! Built in the 16th century, it’s been extended and changed twice. The Gothic outer facade is actually from the 19th century. Today, Ehrenburg houses the regional library of Coburg with more than 400,000 books. You can do a tour of the castle and see 25 of the historic rooms – learn more about Ehrenburg at the website. If you just haven’t had enough Castles yet, you can grab a taxi or take a one hour walk from the Market Square to another castle – called Callenberg Castle. Callenburg is mainly a hunting and summer castle which also acted as the main residence of the Dukes of Saxony-Coburg-Gotha. The castle was officially mentioned in the records for the first time at the beginning of the 12th century and it has changed ownership quite a few times over the centuries. Like Veste Coburg, Callenburg is also on a hill so you’ll have a great view from up there. Part of the castle has been made into a museum which you can visit and it’s great if you are interested in the seeing the historic rooms and furniture that’s on display. To learn more about Callenburg Castle, check out the website. 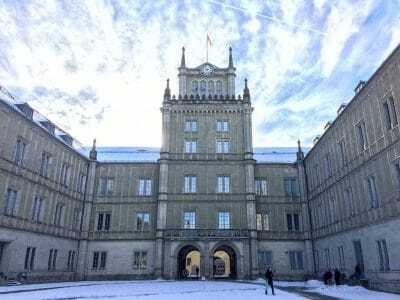 If you are interested in Museums, you have three main ones to choose from in Coburg: the Naturkundemuseum, the Puppenmuseum, and the Arts Collection of the Veste Coburg. In the Naturkundemuseum, you can learn about evolution, the history of earth and humans, as well any special exhibitions that change regularly. You can find the Museum at the border of the Hofgarten and might actually pass it on your way up to the Veste. It is open from 9am to 5pm daily. As mentioned above, you can visit the art exhibition at the Veste Coburg. They also have a huge collection of glass art if you are interested in that kind of artwork! It is open from 1pm to 4pm daily, except for Monday when it’s closed. Even though Coburg is a smaller city, there are still lots of great options for having a coffee and a snack or grabbing a full-on meal. We list a few of our favourites below. Not far from the Schlossplatz and the Hofgarten you’ll find Feiler – one of the best coffee shops in Coburg. Lisa brought Eric there for Valentine’s Day and it did NOT disappoint. Not only will you get delicious coffees, teas, cakes and other baked goodies – but you can also enjoy a great lunch. The menu changes every day – but they are always sure to have different options on the chalkboard so you’ll most likely find something worth trying. They also have really good breakfast and brunch options if you’re looking to start your day the German way! Have a look at their website here. Address: Theaterplatz 5, 96450 Coburg. Another great café and a favorite among locals is Café Pfannküchle. As the name suggests, besides coffee they offer a huge variety of pancakes (we’re talking about thin European pancakes here!). From sweet to savory options, you’ll be sure to find one you like. Of course, they also have other food options that are great for an afternoon snack. Visit the Pfannküchle website. Address: Markt 11, 96450 Coburg (right by the Market Square). If you are looking for a restaurant that serves authentic Franconian/Bavarian food then you should absolutely head to Goldenes Kreuz. This is a classic in the city, you’ll be sure to find something that sparks your fancy – from roast port and bratwurst, to spinach dumplings and apple horseradish soup. You can find the whole menu here if you want to have a look beforehand. If you prefer more of a pub than a restaurant and you’re looking to be hip with the younger crowds, then dinner at Sonderbar would be for you. They also often have live music events, readings, or other fun activities so you could also just head there for a drink after dinner. You can check what is going on at Sondebar here. Another great option for a classic dinner is Hopfen & Malz as they offer authentic Franconian dishes. There’s a variety of other dishes as well, though. It’s a small, cozy restaurant perfect for a nice evening meal. Check out their Facebook Page here.